Epiphone presents the Inspired by “1966” Century electric guitar, a faithful reissue of the classic thinline all-hollowbody archtop featuring the new Epiphone P-90 PRO™ single-coil pickup. The “1966” Century is available in both a Cherry and Vintage Sunburst Aged Gloss Finish. In Epiphone history, the “Century” name goes all the way back to the 1930s big band era, when the “House of Stathopoulo” was making some of the best archtops ever made. And when Epiphone merged with Gibson and moved its productions to Kalamazoo, Michigan in 1957, the Century was reborn as a popular thinline archtop, similar to a Casino or a “335” but with a slightly smaller body and a single P-90 pickup. The Epiphone Inspired by “1966” Century hollowbody thinline archtop revives the mid 60s design prized by collectors for their comfortable, lightweight body with neck joint at the 14th fret and warm, woody tone. 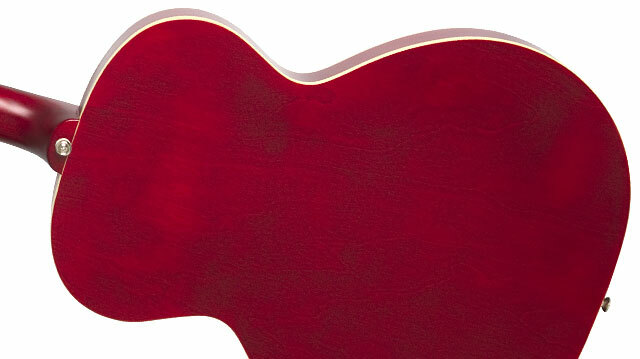 The Laminated Maple body features a Maple top and both the top and back have Ivory colored single layer binding. The Mahogany neck has a Rounded “C” shape and a 25.5” scale with Pearloid “Dot” inlays, 20 medium frets, and an original nylon nut. The Century is available in an Aged Gloss finish in either Cherry or Vintage Sunburst. And a 1960s era Replica Blue Soundhole Label can be seen through the upper f-hole. The white and black layered pickguard has a classic 60s era "E”. The Epiphone Inspired by “1966” Century is powered by the new single coil P-90 PRO™ pickup, recognized around the world as the most versatile and expressive single coil pickup available. Just like originals P-90s, the Epiphone P-90 PRO™ is an extremely sensitive pickup that easily bends to a player's unique touch. With its distinctive growl and wide tonal range, it's great for rock and roll, pop, jazz, country, or anything you want to throw at it. 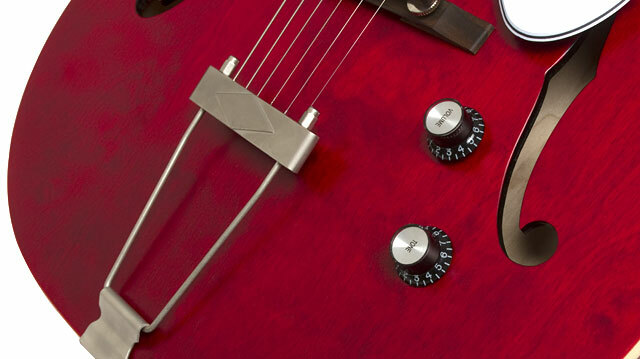 The P-90 PRO™ features 18% Nickel Silver covers designed and tooled from the ground up with new bobbins manufactured to historic dimensions, Elektrisola magnet wire, sand cast Alnico V magnets, and pole shoes manufactured using correct alloy. And for you sticklers to detail, Epiphone P-90 PROs™ also have tin plated brass base plates like those used on 50s and 60s era Gibson P-90 pickups. Controls are simple Master and Tone knobs. The Epiphone Inspired by “1966” Century includes legendary Wilkinson® Vintage 3-in-a-row machine heads with plastic Ivory buttons with a 14:1 tuning ratio that are mounted on a Historic Sloped Dovewing headstock with a gold "Epiphone" logo. 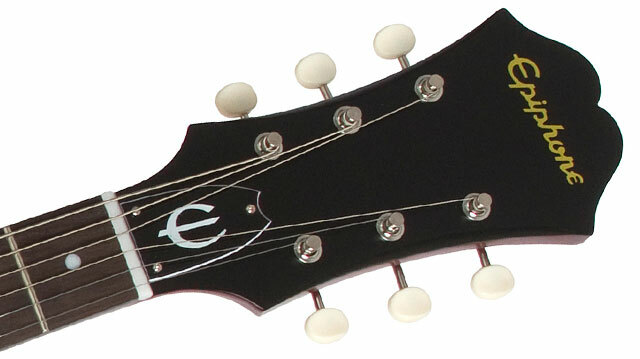 The dual action truss rod has 60s era black "Bullet” cover with a Vintage "E" in white. 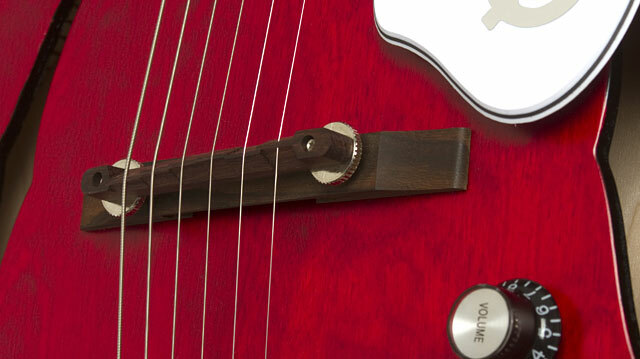 The floating adjustable bridge is supported by a traditional “Trapeze” style tailpiece. The “1966” Century comes strung at the factory with D'Addario strings. Like all Epiphones, the Inspired by “1966” Century archtop comes with a Limited Lifetime Warranty and world famous 24/7/365 Gibson Customer Service. Visit your nearest Epiphone dealer or visit Epiphone.com to find a dealer near you and discover the classic Inspired by “1966” Century archtop today!